Hiring the right magician for parties can make or break an event. Different entertainers deliver different shows so finding the best magician for parties is crucial for the ultimate party for your child. There are a few things that you should keep in mind when you are seeking a magician for parties in the NJ area. Here are some tips. Talk to your the magician before your event. 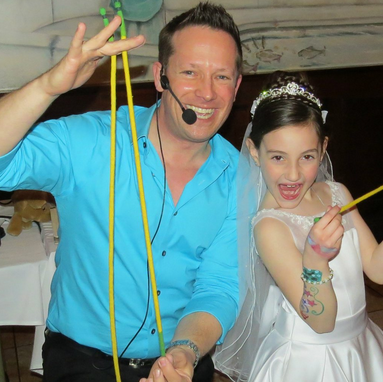 A truly professional, top-notch kids’ magician for parties will speak with you personally before your event in order to personalize the entertainment to your specific needs. That way, your attendees are guaranteed the best possible event. Don’t book a kids’ magician for parties just because they have a great looking website. Talk with them to be certain that they have a fun and outgoing personality. Not all NJ kids’ magicians for parties are created equal. You are likely to encounter a series of paid advertisements for party and event entertainment, but finding a quality kids’ magician for parties is the hard part. Many magicians entertain part-time on the weekends for some extra income. When planning your event, a “full-time” entertainer is your best bet, as they will have the most experience and they will have a vested interest in making your event the best it can be. This isn’t to say that all part-time magicians for parties are mediocre. There are many out there that can rival the best. Make sure that you seek out a magician who is good with children. Not everyone can captivate children while creating memories that will last a lifetime. Not all magicians truly understand or work regularly with children to truly understand what it takes to keep their attention. Given the short attention spans of children, you want to make sure that you choose a kids magician for parties who has a proven track record of success when working with kids. A kids’ magician whose experience involves mostly working with adults may not be able to retain the attention of young ones for 5 minutes, let alone 45 minutes. So make sure that the entertainer you choose likes kids and has a truly animated, fun-loving style. Any entertainer worth considering will be able to provide references. Entertaining a young audience is no easy task, so booking an entertainer who is just starting out is a risk that you should not take a chance on. All good entertainers will be able to provide references on request from past clients. Be wary of those who cannot or will not give you any references or recommendations. You get what you pay for. The better entertainers are worth paying for, even in a tough economy. The price of a good NJ magician for parties generally reflects the quality of the services they offer. So, while a less expensive entertainer may reflect a financial savings, the rule of thumb in the children’s entertainment industry is that the cheaper the rate, the poorer and more limited the performance. If you hire someone because of their great price but they end up putting the kids to sleep, you’ve actually overpaid. If you pay a little more and the kids, adults and even the teenagers have a great time, you’ve gotten a great deal. Looking for an Awesome NJ Magician for Parties? Tyler Winters is a master NJ magician for parties and is the owner of Izzy’s Entertainment. He has been providing kid’s party entertainment services for over 25 years. His services are perfect for Communions, Christenings, Corporate Events, Block Parties, Festivals, Store Grand Openings, and Baby’s First Birthday Parties. Tyler will incorporate different magic tricks into his show tailored to the age range of the children. Service areas in NJ, NYC, & PA include Red Bank, Princeton, Millburn, Westfield, Hoboken, Alpine, Essex Fells, Manhattan, Upper Saddle River, Rumson, Fair Haven, and many more! Contact Izzy’s Entertainment today for your child’s special event by calling (732)266-3471 or visiting the website.